On October 7th Eurostar announced a £700 million investment plan to purchase 10 new 16 car e320 trains from Siemens that will run from 2014, and from 2011 onwards upgrade the interiors of its existing 28 trainsets. Following that DB showed two ICE3 trainsets at St Pancras on 19th October, and ran an evacuation test in the tunnel using a 200m long trainset, and plans to run trains from the end of 2013. Full coverage from Railway Gazette of the Eurostar and DB plans. So the future of cross channel rail travel is looking bright? Yes, I would say, but I would bet it’s not going to be all as smooth running as the presentations from either company would have you believe. Here are a few points that I wished a few journalists had thought to cover. On channel tunnel safety the big question is with DB’s plans. Their idea is to run 2, 200m long, 8-car Velaro D (more on these trains in German here) trainsets through the tunnel, coupled together to form a 400m long train. At the moment safety rules stipulate that a train must have an exit door for passengers next to a doorway to the security tunnel, and these doorways are 375m apart inside the tunnel. As no gangway exists between the coupled Velaro Ds then will the DB train gain the security clearance? Clearance is not even guaranteed for the new Eurostar e320 trains as they have decentralised traction (i.e. no ‘locomotives’ at front and rear, everything instead under the floors), and no trains of this type currently run through the channel tunnel. 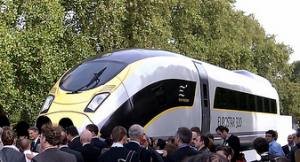 Alstom, one of the losing bidders for provision of the new trains and main contractor for the original Eurostars is going to court over the matter, claiming that the Siemens bid does not meet the terms of the tender. On journey times the picture gets murkier. Eurostar’s official page states that the “e320 could see journey times between London and Paris reduced to just over two hours, London to Amsterdam to under four hours and London to Geneva to around five hours”. Or not, especially for Paris. Remember that 28 of Eurostar’s 38 trains will be old ones, capable of only 300km/h and not 320km/h. Further recall that most of the new ones will be en route to Amsterdam, Geneva etc. and not to Paris. And then furthermore consider that the high speed line between Calais and Paris, via Lille, is rated at 300km/h. Amsterdam in under 4h seems reasonable, and Geneva is probably likely to be in the region of 5h15. DB’s estimates seem reasonable on journey times. The best Eurostar today does London-Brussels in 1h51, and an ICE does Brussels-Frankfurt in 3h05, so London-Frankfurt in 5h seems a sensible claim. However the devil here might be Infrabel, the Belgian rail network operator – ICEs are only allowed to operate at 250km/h at the moment (rather than the 300km/h for Thalys trains) on LGV 2 between Leuven and Liège. Will Infrabel impose a similar restriction on ICEs between the French border and Brussels on LGV 1? Maybe ‘a little over 5h’ is more realistic. Equally as the Eurostar e320 is essentially the same technology as an ICE will the same restrictions apply to those trains too? A further headache will be station security. At the moment there are 7 main Eurostar stations – St Pancras, Ebbsfleet, Ashford, Calais, Lille, Paris, Brussels – and all of them have bag scanners and waiting lounges for passengers. When new stations are added permanently to the cross-channel networks of Eurostar or DB what happens? Do special secure areas need to be built at Amsterdam Centraal, Rotterdam Centraal, Frankfurt/Main Hbf, Köln Hbf? In the latter – a very crowded station – it could be complicated. Geneva is easier (the French platforms are semi-separate anyway). OK, Eurostar’s security is 99% about reassuring passengers and 1% about proper security, but daily services to more destinations are going to mean this has to be looked at. There’s also the fact that the UK is outside Schengen, so where would all the passport checks take place? Lastly there’s the crash safety situation and this is the potentially serious one that no-one dares talk about. Alstom/TGV style trains (such as the current Eurostars) are much safer than Siemens/ICE trains (such as all current German ICEs, Velaro Ds and the Eurostar e320s). This is because Alstom high speed trains have an articulated trainset arrangement with shorter carriages and the bogies between the carriages. Siemens trains are organised the traditional way with two bogies beneath each carriage. This makes it significantly less likely that the carriages of an Alstom high speed train tip over than for a Siemens equivalent. A Eurostar derailed at 290km/h in 2000 and there were just 14 minor injuries (see 2nd article here). Eschede – the worst train accident in German history – would not have caused anywhere near the number of fatalities if the train had been a TGV rather than an ICE. This point is made in this story from The Independent at the time of that accident. Right, so there you have it folks – 850 words on all of the challenges to come before we’ll be heading to new and shiny destinations from London St Pancras International! Woo hoo, Alstom is now taking its complaint to the European Commission, claiming Eurostar did not follow EU procurement rules when it signed the contract with Siemens for the new trains. As if that were not enough Alstom (and the French government) continue to publicly complain that the Siemens trains don’t meet the channel tunnel safety criteria because they have distributed traction, despite the fact that Alstom’s unsuccessful bid was also with a train that had distributed traction, its AGV. It appears the Tunnel rule changes were close to being signed off by the two governments (the French were signed up since Alstom’s new trains needed them too). Whether they will now only be delayed or thrown out completely remains to be seen, but the chances are it’ll only be a delay intended to bring Alstom back into play. On the length point, the original rules cannot specify that passengers must be able to go straight from the train into an emergency exit, otherwise the trains built for the “regional eurostar” services (GNER used some on the Leeds route for a bit and now SNCF uses them from Paris to Lille) would have been too short, so there must be some leeway there for DB to exploit. There is plenty possibility for Infrabel (and RFF) to set DB massive hoops to jump through before they can run their services at sufficiently high speeds, but I suspect that deals can and will be done. As well as the new stations, Brussels will also need work on security facilities, unless the plan is to reverse in the current Eurostar platforms and trundle round the western loop past Simonis rather than going through Central. The economics will be a lot harder for DB if they can only carry passengers through to the UK. But who’s going to show up half an hour early to go through security on an Amsterdam-Brussels service if they can turn up and go – presuming it comes into service before DB services do;-) – on a Fyra service? Remember there’s still the sale of the British share in Eurostar in play. DB is still a possible purchaser, and from SNCF’s point of view it may be better to have them inside the tent etc. rather than competing with them. So all these developments may just be manouevring round that. Moreover, there’s also the possibility that SNCB will sell its share. Having through trains through Brussels to London would allow SNCB to sell out without the flak from Brussels-London services being abandoned. And a sale to DB would no doubt be conditional on removing barriers to homologation for the ICE.